Giant Robots. One-on-one beam saber action. Macross Missile Massacre (tm). The only thing that would make this game better would be online multi-player capability. Oh yeah, it has that too. This free Gundam clone offers surprisingly addicting gameplay and lets you indulge that fantasy you've always had ever since you saw your first Gundam anime. 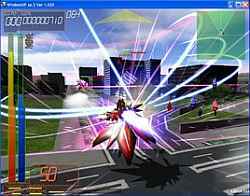 3-D arenas pitting teams of mecha against each other makes the gameplay just like the Gundam Arcade game in Japan, which is similar to Armored Core and Virtual On, but you don't have to blow 100 yen each time you want to play. This game has the following ways of giving you your Gundam-piloting fix: Survival Mode - Fight until you drop; Practice Mode - Go ahead, bully the defenseless computer; Team Battle Mode - Ever wonder what it was like to pit one army of mecha against another; Blitz Tactics Mode - One army versus another, but with giant warships too; Online Contest Mode - Because destroying your friends is always more satisfying; Custom Pilot Creation - We all love the default cat pilots, but the game also includes the option of using your own avatar pic and different voiced effects, even your own! Don't worry, the cats aren't offended. Base Installer includes custom Ryuusoul pilot.